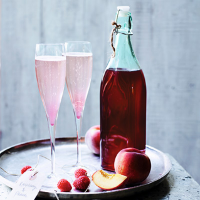 This cordial delivers a heady hit of high summer to a range of cocktails - or try using it in summer-fruit desserts or folded into whipped cream. 1. In a pan, heat the peaches and raspberries in 560ml water. Simmer gently for 10-15 minutes until the fruit has completely broken down. 2. Line a colander with muslin and sit it over a large bowl. Pour in the strawberry mixture, then tie the corners of the muslin, remove the colander and suspend the muslin over the bowl. Leave the mixture to strain into the bowl overnight. 3. Pour the strained juice into a clean pan, stir in the sugar and heat gently until dissolved. Bring to the boil and bubble for a few minutes until slightly syrupy, skimming off any foam that rises to the surface. Transfer to sterilised bottles with a heatproof funnel and seal.